The idea of growing your own fruits and vegetables and living off the land is certainly an alluring one. However, for most of us, the dream of a bountiful garden producing fresh organic vegetables remains just that, a dream. Some of us take action and buy the seeds, soil, fertilizer, protective fencing, 'how to' books and find the perfect location with just the right amount of sunlight, according to the experts, to turn our dream into a reality. Those with a green thumb may grow a tomato or two, but most end up with nothing more than a black thumb and some wilted green beans. It's not that growing vegetables is rocket science, after all, vegetables have been grown on this planet, without the aid of YouTube videos, guide books and Home Depot gardening classes, since 9,500 BC by early farming communities. The problem, for most of us, is time. We lack, or choose not to allocate, the time required to properly maintain and water the plants. Too much water can drive air out of the soil around the plants' roots, and eventually the roots drown and die. Too little water can often lead to the same end result, dead roots. 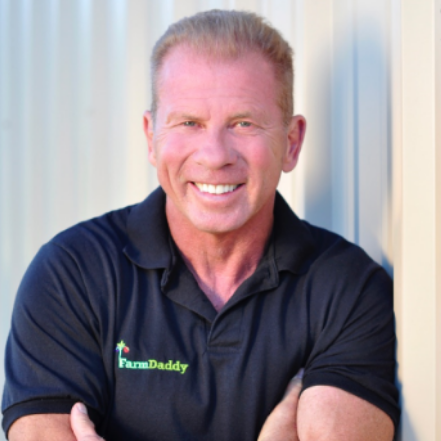 Randy Porter, founder of FarmDaddy, has designed, engineered and manufactured a container that does the work for you. With his patented self-watering system, the chore of having to maintain the perfect level of moisture has been completely eliminated. Porter's system even allows for multiple, 600 to be exact, containers to be hooked up to one hose and for individual containers, regardless of position along the chain, to be watered independently of others. Porter, who at one point knew nothing about growing vegetables, shared the story about how FarmDaddy came to be. "I always had an interest in being self sufficient," he said. "My dad was a scout leader. He taught us from an early age how to take care of ourselves. Along those lines, I wanted to learn how to grow my own food, but knew nothing about it. People I spoke with said it was a lot of hard work that involved weeding, monitoring and a full commitment. I knew I wouldn't have the time. Then I learned about container growing and thought, 'I can do that'. What I didn't realize was that you still had to water the plants. I'd remember in the middle of the night that I'd forgotten to water the plants. I'd have to go out there in my pajamas and give them water. It was a pain. I took a three day trip and hired a neighborhood kid to water my plants while I was gone. When I came home, everything was dead and the kid disappeared. I was so angry about the whole situation, but I was also motivated and inspired to develop a solution. I slept on the idea that night. When I woke up, I designed a self-watering growing container. Call it divine or give the credit to a higher power, but the idea came to me overnight." Porter bought scrap parts, hooked up it all up and it worked. He spent the next two to three years perfecting the design, doing more research, buying quality parts, having molds made and experimenting with growing different types of vegetables. At the time, Porter was still running his own painting company, but found the time to take his new product to trade shows and garden shows throughout the state. Once the containers got out there, people took notice and started buying them. Things took off pretty fast and Porter let the painting company go. Over the past 10 years, Porter has perfected the design of the FarmDaddy containers and found his true passion along the way. "I really enjoy growing my own food," he said. "What's great about our containers is that they use 60% less water than traditional gardens. What's great about growing your own food is that you know exactly where it comes from. The quality, taste and nutritional value of vegetables you grow yourself, compared to store-bought vegetables, is night and day." Porter also shares his love of growing food with the local community. At the FarmDaddy facility, on Mellonville Avenue, 120 containers are dedicated to providing food for food pantries and other needy groups. They also raise honey bees and give away fresh eggs. Porter has even extended his philanthropic reach beyond Sanford to include, turning a parking lot of a special needs school in Miami into a garden, helping to feed the community of Bithlo, FL, by setting up a community garden and giving presentations to clubs and organizations about growing your own food. Grand ideas inspired by the divine, more often than not, carry the weight of lofty, and in some cases, world altering visions. For Porter, who sees teaching people how to become successful gardeners and grow their own food as the number one reward, this worldly vision is an actual long-term goal of his. "I want to get to a place where I can take these to 3rd world countries, set up a complete FarmDaddy system with rain barrels and teach them to grow their own food and become self sufficient," he said. "We all need food, shelter and water. I want to do my part to reach out and feed hungry people across the world." Porter offers up some great advice for people thinking about taking the plunge into entrepreneurship. "The rewards are so tremendous, but count your costs," he said. One thing that was frustrating with Farm Daddy was that I didn't know what things were going to cost. Certain things, like my patent, were way more expensive than I thought. Talk to people that have gone through the process. Know your true cost before you jump in. There are going to be sleepless nights and times you're not sure if you made the right decision, but stick with it. Don't walk away when things get tough. Follow your heart and your dreams and also remember to surround yourself with positive people."